Publishers have stopped referring to their products as journalism, writing, literature, photography, or art. Today, everything is simply “content”. Those working in media, especially digital media, can attest to the word’s popularity. Quantitatively we can observe this trend in the chart above: over the last ten years, annual financial reports from The New York Times have leaned more and more heavily on the word “content” when describing their business. 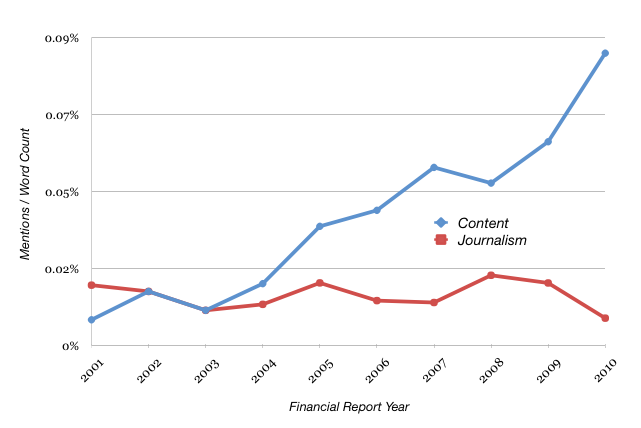 The share of “journalism” has remained relatively flat.